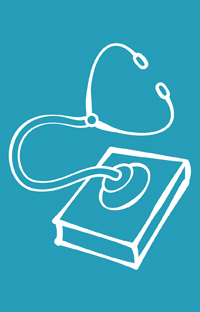 Meet this month's Book Doctor... Chloe Coles! As a special treat for book-loving children and teens, Chloe Coles, author of the hilarious Bookshop Girl books and children's bookseller extraordinaire, is our guest Book Doctor! You sent in your reading ruts – whether you were after funny books or book recommendations for your ballet-loving niece – and Chloe has picked five to answer. 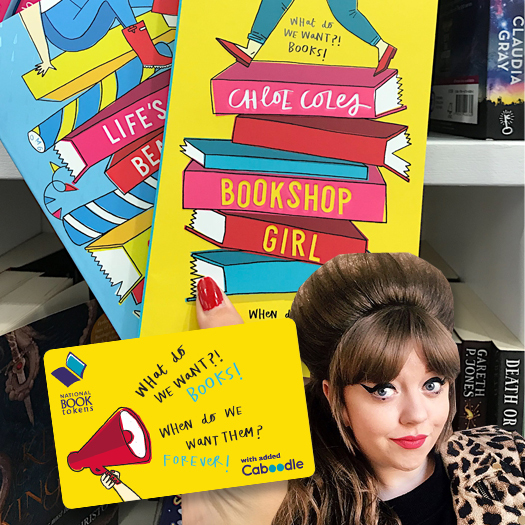 All five Caboodlers will each receive a £15/€20 National Book Token, and signed copies of Chloe's Bookshop Girl and Life's a Beach. Got a bookish bothering of your own? Send your questions in – if we pick yours for the attention of our future Book Doctors, you’ll get a National Book Token! Ouchie! Nothing sadder than a bashed up book. I feel your pain, Miya. I usually put my books in carrier bags before shoving them into the gross-fest-Narnia that is My Handbag. Lipstick, gum, leaky pens and melty chocolate are all very real threats to the paperbacks I lug around with me. I really love to hear that you read during the school day and obvs you do not want to miss out on that - so maybe you can get crafty? At the bookshop I work in, we wrap books in cellophane to prevent damage (especially in the kids section. I have seen very bad things happen to very good books at the hands of demon toddlers). You could try wrapping the covers of your books in gift wrap or a thin fabric to protect the corners. You could of course turn this sitch into an opportunity to accessorise! Make a little fabric tote to use as a book bag - that way it'll be separate to all the sharp, squashy things you keep in your school bag and locker. Hey Joanna! Sure, reading isn't for everyone. I have to say that in my experience, the older you get, the more you realise that people who think reading is boring are actually pretty...boring themselves! In the meantime why don't you share books you've enjoyed with your friends? Some people might find reading quite meh because it's a solitary activity. So if you give one of your mates a book that you're really into, it's something you can share and Discuss with a capital D, like you would with your fave programmes on telly, or walking home from the cinema. Whatever you do though, don't let anyone trick you into thinking books aren't cool, because it's just not true. I love Christmassy books! Nearly as much as I love mince pies and tinsel and getting way too excited way too soon. This year I’ve got my eye on the new, gorgeous edition of Christmas Days by Jeanette Winsterson. It's a collection of festive short stories, anecdotes and recipes (including ‘Kathy Acker’s New York Custard’!) from the author of Why Be Happy When You Could Be Normal?, which broke my heart before putting it back together again. I'll be sure to slip into this cracker before the end of the year. 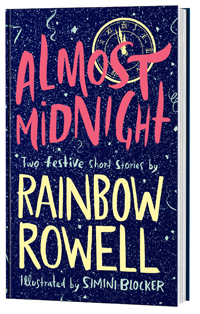 I’d also recommend Almost Midnight by Rainbow Rowell. It's small and cute and GLITTERY, containing two festive short stories that'll warm you up like a hot choc with extra marshmallows and cream. DE-LISH! Make sure you wash your hands, Katie! I know what you mean though, there's nothing more annoying than being bugged in the middle of a really good book. Sometimes I try to read behind the till at work, but that's a terrible idea and gets me into trouble. I like reading on the bus, because nobody ever wants to talk to anybody else on the bus. If you put your earphones in and pretend to be listening to something, then you really are cut off from the outside world. You’re sending out 'don’t even think about it' vibes. I've also seen these little badges that say ‘Don’t Bother Me I’m Reading’, so maybe you should invest in one of those, or make your own? Hi Amer! I think that if you've already started having some ideas about your book then GUESS WHAT? You've already started! I know that sometimes a blank page can seem like the scariest, most daunting thing in the world, but it sounds like you’ve already got it all going on up in your head. I never write any of my stories in chronological order, it's just not how my head works. Instead I have little chicken nugget ideas. A convo in a chip shop or the way a character will style their hair will come to me, and I'll scribble it down in my notebook. It can take a while for any of the nuggets to make any sense, but if you get it onto paper bit by bit, you'll have a huge delicious McFEAST before you know it. Then you can work out what goes where, and all that takes really is a bit of organisation. Set a day off to type up all of the idea nuggets and OMG - you’re suddenly like, An Author. Time is easy, ideas are the hardest bit. You've got it. Bookshop Girl and Bookshop Girl: Life's a Beach are out now, published by Hot Key Books, £6.99.